West Oakland’s Brown Sugar Kitchen joined food-tech company BlueCart in a project to reduce food waste, although diner behavior remains the biggest culprit. In the homey dining room at West Oakland’s Brown Sugar Kitchen, servers glide between tables offering refills on coffee while line cooks work in the open kitchen, frying chicken in front of a row of countertop seats. 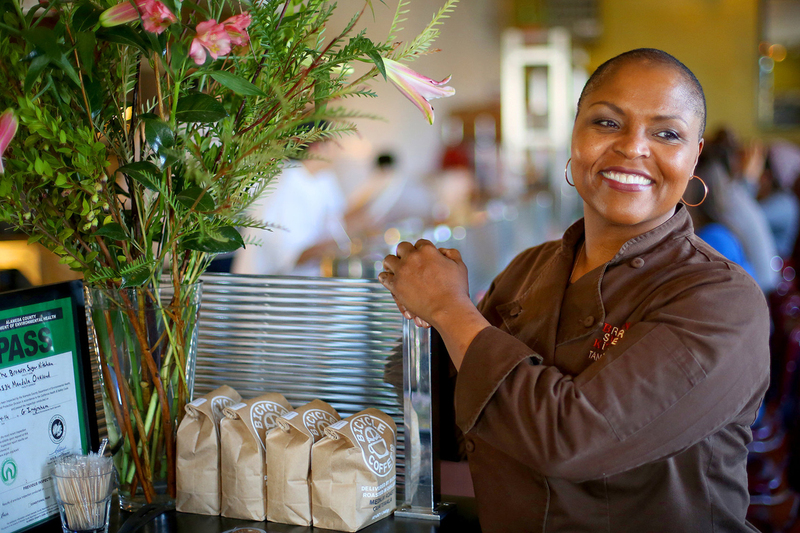 A neighborhood favorite, the restaurant’s warm atmosphere combines owner and chef Tanya Holland’s French culinary training with traditional down-home soul food to create dishes like BBQ shrimp and grits, beignets, and buttermilk fried chicken served with a cornmeal waffle. Though nothing in Brown Sugar Kitchen’s dining room or menu shows off the restaurant’s environmental credentials, Holland has long used sustainable practices, including ordering from local vendors and composting. Now it is pursuing a new, even more ambitious goal: a zero waste kitchen. Organized by Blue Cart, a startup that uses technology to streamline the ordering process for restaurants, the Zero Waste Kitchen initiative worked with three chefs from around the country over the course of two months this spring to promote sustainability and reduce wasted food. Alongside Chef Tim Ma (of Kyirisan in Washington, D.C.) and Chef Jehangir Mehta (of Graffiti Earth in New York), Holland spent two months tracking her food waste and identifying different actions—from composting to team culture, products, and sourcing—that can reduce her restaurant’s environmental footprint. Zero waste efforts address a serious issue that affects both commercial and home cooks; some 50 percent of all produce in the United States ends up in the trash can. Not only does the lost sustenance fill up landfills, accounting for 20 percent of our annual municipal landfill content, it also costs a family of four an average of $1,500 each year. The Zero Waste Kitchen project points to a growing trend among restaurants to support environmentally friendly policies beyond buying organic or local. Blue Cart, a venture capital-funded startup launched in 2014 by business partners Konstantin Zvereff and Jagmohan Bansal, offers a mobile platform to help farmers, restaurants, and hotels manage their wholesale orders and improve communications between buyers and suppliers. While Blue Cart didn’t start out with a mission to reduce waste, its founders soon realized that by making the ordering process more efficient and easier to track, they were also empowering their users to practice lean ordering techniques: buying only what they need and reducing both costs and waste. Soon Blue Cart found its users were reducing their food waste by up to 52 percent. “We did not anticipate or design for this,” Zvereff explained. Still, the startup has leaned into the project. In addition to repeating the Zero Waste Kitchen project with more chefs in more cities, they’re also planning to create a forum on their app for discussing zero waste techniques, and have added features to the app to encourage buyers to purchase items that are often overlooked—other chefs mention unusual grains like amaranth and rye or cheese whey as examples—reducing waste at the supplier level. While Zero Waste Kitchen has been an eye-catching effort for Blue Cart, they are far from the first to advocate reducing kitchen waste, both in restaurants and at home. LeanPath also offers restaurants and food service companies a set of tools that help them record and reduce waste. Initiatives like Hungry Harvest and Imperfect Produce attack the problem from the other end by redistributing food that would otherwise go to waste. The Natural Resource Defense Council (NRDC) and Ad Council’s recent Save the Food campaign is also reaching a wide swath of consumers with its messages about cutting waste in home kitchens. Earlier this year, the James Beard Foundation partnered with NRDC to run a day of advocacy training in Nashville before the city kicked off its Food Saver Challenge, an effort to trim restaurant food waste and provide the city’s hungry residents with affordable, nutritious food. As Brown Sugar Kitchen’s Holland notes, for busy chefs looking to get involved in policy or political conversations outside the kitchen, food waste is an easy sell. Most restaurants are already laser-focused on processing food as efficiently as possible since lost food equals lost revenue. A formal zero waste commitment is a simple step to take, aligning the kitchen and staff around a common goal. For Holland, prioritizing a low-waste operation dates back to the lessons she learned while earning a Grand Diplôme from La Varenne Ecole de Cuisine in Burgundy, France. “It is about producing the perfect carrot,” she said, “but it’s also about using everything. Nothing went to waste, everything went into a stock or a staff meal, and that’s how I am.” For example, Brown Sugar Kitchen smokes its own meats but can’t always sell them all. Any meat doesn’t sell the day it’s smoked gets cut off the bone and used for their signature hash. The restaurant’s small kitchen and limited storage ability, (they have no walk-in refrigerators or freezers), also mean that the lean, precise ordering Blue Cart promotes is already integral to the operation. With little room for extra food, every item must be ordered with care, and it’s hard for items to get lost or spoil in the back. The restaurant extends its low-waste policies to the front of house as well, encouraging servers and staff to be mindful about making that extra pot of coffee at the end of the day or pouring out too much cream, which can’t be reused, into the coffee bar’s self-serve canisters. A few years after opening, Brown Sugar Kitchen began donating its raw food scraps to nearby City Slicker Farms, to use in compost. In addition, the restaurant also composts through local waste management company Recology, and gives jars and milk jugs that it can’t reuse to the East Bay Depot for Creative Reuse, which repurposes them as low-cost art supplies for local educational and social services. Ultimately, however, restaurants can only go so far to solve food waste. Holland estimates that her biggest source of wasted food isn’t meal prep or kitchen ordering: it’s her customers’ ordering habits. NRDC’s food waste expert Andrea Spracht agrees. “The biggest source of wasted food in restaurants is front of the house: patrons’ plates.” She advises consumers to be more mindful about their ordering habits and about supporting restaurants that are making an effort to reduce food waste. Whether it’s getting used to seeing unpeeled carrots on a plate or expecting smaller portions at brunch, Holland hopes diners will adapt.